Drivers honked and waved. They gave thumbs up to the 30 people on the sidewalk. The group was holding signs outside a North Carolina poultry plant. “El baño” – the bathroom – was the word catching the drivers’ attention. The scene on August 14 was a demonstration in front of the Case Farms poultry plant in Morganton, NC. The company supplies chicken to KFC, Popeyes, and Taco Bell. Alisa Olvera outside of Case Farms poultry plant in Morganton, NC. The reason for the peaceful protest? The Case Farms plant has a sanitation problem. Workers don’t have access to the bathroom when they need to use it. Are KFC, Popeyes and other firms that buy chicken from Case Farms —-hundreds of millions of pounds each year— ignoring the problem? If they aren’t touched by the indignity of restricting bathroom breaks at Case Farms, surely they care about the sanitation problem. They proposed a meeting in mid-September at the St. Charles Catholic Church in Morganton, NC. Case Farms has yet to respond to the request. Hunter Ogletree with WNCWC agreed with that statement. “The poultry workers we know are hard-working, dedicated, and thoughtful. …They know it takes a team, and they’re eager to be part of that team, and build on success. 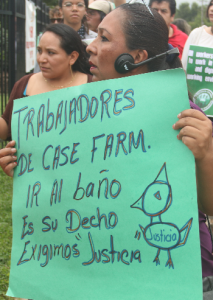 On the day of the demonstration, the Case Farms’ workers learned that a U.S. Senator has his own concerns about the poultry company’s operations. Ohio Senator Sherrod Brown wrote a pointed letter to Case Farms’ CEO Thomas Shelton about poor working conditions in the company’s plants, including dozens of willful and repeat OSHA violations. Case Farms also operates two poultry processing plants in Brown’s home state. The Senator referred to an investigation by reporter Michael Grabell which was published at ProPublica and The New Yorker. Grabell describes a company history of hiring refugees because they are least likely to complain, delaying appropriate medical care for injured workers, and interference in workers’ efforts to organize a union. I’ll be eager to learn if Case Farms’ CEO responds to Senator Brown’s letter. The Western North Carolina Worker Center and its allies should make sure that YUM Brand’s CEO Greg Creed (KFC and Taco Bell) and Restaurant Brands International’s CEO Daniel Schwartz (Popeyes) get a copy of the Senator’s letter and Michael Grabell’s article in The New Yorker.